This post is intended to walk somone through the process of establishing an external testing platform that is linked with the upstream OpenStack continuous integration platform. If you haven’t already, please do read the first article in this series that discusses the upstream OpenStack CI platform in detail. At the end of the article, you should have all the background information on the tools needed to establish your own linked external testing platform. What Does an External Test Platform Do? The developer submitting a patch can use those links to investigate why their patch has caused test failures to occur for that external test platform. Why Set Up an External Test Platform? Drivers and plugins that may not be used in the default configuration for a project can be tested with the same rigor and frequency as drivers that are enabled in the upstream devstack VM gate tests. This prevents bitrot and encourages developers to maintain code that is housed in the main source trees. Determining a standard set of tests that prove a driver implements the full or partial API of a project means that drivers can be verified to work with a particular release of OpenStack. If you’ve ever had a conversation with a potential deployer of OpenStack who wonders how they know that their choice of storage or networking vendor, or underlying hypervisor, actually works with the version of OpenStack they plan to deploy, then you know why this is a critical thing! Why might you be thinking about how to set up an external testing platform? Well, a number of OpenStack projects have had discussions already about requirements for vendors to complete integration of their testing platforms with the upstream OpenStack CI platform. The Neutron developer community is ahead of the game, with more than half a dozen vendors already providing linked testing that appears on Neutron code reviews. The Cinder project also has had discussions around enforcing a policy the any driver that is in the Cinder source tree have tests run on each commit to validate the driver is working properly. Similarly, the Nova community has discussed the same policy for hypervisor drivers in that project’s source tree. So, while this may be old news for some teams, hopefully this post will help vendors that are new to the OpenStack contribution world get integrated quickly and smoothly. If something goes wrong, you have to re-install everything from scratch. If you haven’t backed up your configuration somewhere, you will have to re-configure everything from memory. You cannot launch a new configuration or instance of your testing platform easily, since you have to manually set everything up again. A better solution is to use a configuration management system, such as Puppet, Chef,Ansible or SaltStack to manage the deployment of these components, along with a Git repository to store configuration data. In this article, I will show you how to install an external testing system on multiple hosts or virtual machines using a set of Bash scripts and Puppet modules I have collected into a source repository on GitHub. If you don’t like Puppet or would just prefer to use a different configuration management tool, that’s totally fine. You can look at the Puppet modules in this repo for inspiration (and eventually I will write some Ansible scripts in the OpenStack External Testing project, too). Before I go into the installation instructions, you will need to take care of a few things. Follow these detailed steps and you should be all good. In order for your testing platform to post review comments to Gerrit code reviews on openstack.org, you will need to have a service account registered with the OpenStack Infra team. See this link for instructions on getting this account. The above will produce the key pair: a pair of files called gerrit_key andgerrit_key.pub. Copy the text of the gerrit_key.pub into the email you send to the OpenStack Infra mailing list. Keep both the files handy for use in the next step. When we install our external testing platform, the Puppet modules are fed a set of configuration options and files that are specific to your environment, including the SSH private key for the Gerrit service account. You will need a place to store this private configuration data, and the ideal place is a Git repository, since additions and changes to this data will be tracked just like changes to source code. git commit -a -m "My new data repository"
Now you’ve got your own data repository to store your private configuration data and you can put it up in some private location somewhere — perhaps in a private organization in GitHub, perhaps on a Git server you have somewhere. The next thing you will want to do is add your SSH key pair to the repository that you used in the step above that had you register an upstream Gerrit service account. If you created a new key pair using the ssh-keygen command above. You would copy the gerrit_key file into your data repository. And change gerrit_key to the name of your SSH private key. And replace jaypipes-testing with your Gerrit service account username. echo "Hello world, this is MyVendor's Testing System"
Change MyVendor to your organization’s name. git commit -a -m "Added Gerrit SSH key and username"
The above should create an SSL self-signed certificate for Apache to run Jenkins UI with, and then install Jenkins, Jenkins Job Builder, Zuul, Nodepool Scripts, and a bunch of support packages. Scroll down until you see “Gearman Plugin Config”. Check the “Enable Gearman” checkbox. 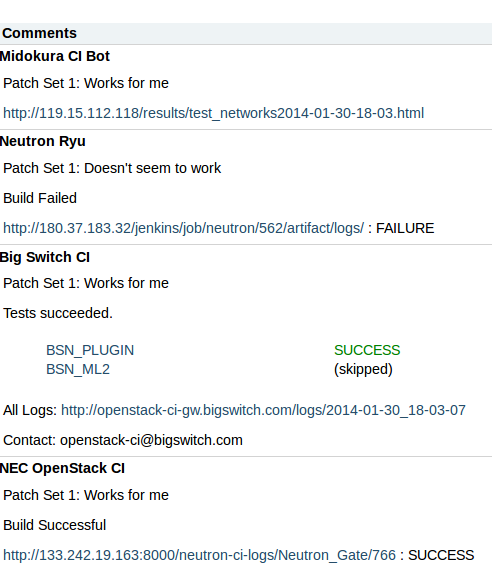 Click the “Test Connection” button and verify Jenkins connects to Gearman. Note that the node is master by default. The sandbox-dsvm-tempest-full Jenkins Job is configured to run on a node labeled devstack_slave, but we will cover that later when we bring up our Jenkins slave. 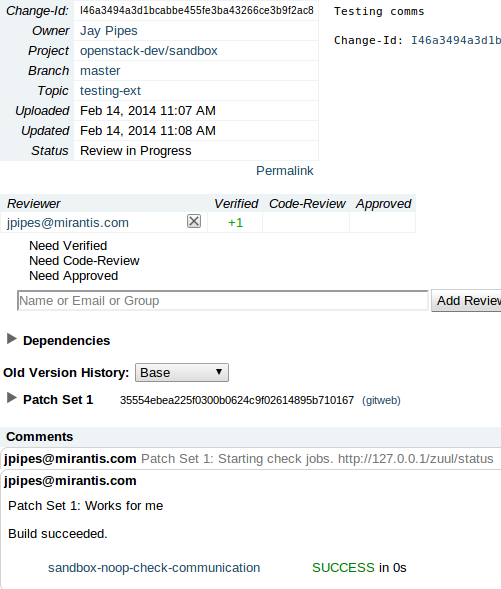 By default, the only job that is enabled is the sandbox-noop-check-communicationJenkins job, and it will get run whenever a patchset is created in the upstreamopenstack-dev/sandbox project, as well as any time someone adds a comment with the words “recheck no bug” or “recheck bug XXXXX”. So, let us create a sample patch to that project and check to see if the sandbox-noop-check-communication job fires properly. Before we do that, let’s go ahead and tail the Zuul debug log, grepping for the term “sandbox”. This will show messages if communication is working properly. git commit -a -m "Testing comms"
remote: Reusing existing pack: 13, done. jaypipes@cranky:/tmp/sandbox$ git commit -a -m "Testing comms"
Congratulations. You now have an external testing platform that is receiving events from the upstream Gerrit system, triggering Jenkins jobs on your master Jenkins server, and writing reviews back to the upstream Gerrit system. The next article goes over adding a Jenkins slave to your system, which is necessary to run real Jenkins jobs that run devstack-based gate tests. Please do let me know what you think of both this article and the source repository of scripts to set things up. I’m eager for feedback and critique.